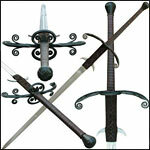 Our Arms and Armour Swords are Functional, Tough, Usable, Semi-Custom Made Medieval and Renaissance Swords. Designed for the Western Martial Artist, Medieval and Renaissance Re-enactor or Stage Performer. We offer Battle Ready Swords which you can choose either Edged or Blunted Blades!